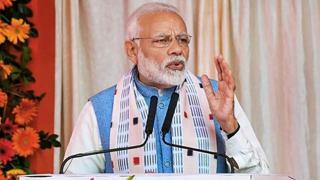 Prime Minister Narendra Modi will be on Tuesday in his second "Pariksha Pe Charcha" in which he will interact with 2,000 students from high school to college, along with their parents and teachers. The event will be held at Talkatora Stadiumand telecast live. "It is a unique interaction where students, teachers, parents and the Prime Minister will come together to discuss issues related to examinations and the stress related to that," the Human Resource Development Ministry said in a statement. This year's event will also see a cultural program of 10 minutes and screening of a short film on the initiative taken by HRD Ministry since last year's "Pariksha Pe Charcha" to reduce the exam-related stress.